“It’s not about changing who you are, it’s about adding a new chapter to your journey… and to our journey as a nation of immigrants,” Obama narrates in his two-minute video urging almost 9 million resident migrants to sign up for citizenship so they can vote in 2016. Obama’s deputies will award citizenship to 36,000 over the next few days. But federal law — and reality — contradicts Obama’s progressive-style denial of Americans’ sophisticated, evolved and unique society, and contradicts his support for a chaotically diverse “nation of immigrants” devoid of any unique and shared loyalties and obligations. “I hereby declare, on oath, that I absolutely and entirely renounce and abjure all allegiance and fidelity to any foreign prince, potentate, state, or sovereignty, of whom or which I have heretofore been a subject or citizen,” says the first sentence of the citizenship oath. Obama’s pitch to would-be citizens actually demands even less from immigrants than corporate recruitment videos demand from prospective employees, said Mark Krikorian, head of the Center for Immigration Studies. The empty pitch “does reflect the washed-out understanding of citizenship we have now, where it is just a practical matter, a way of getting a more useful passport, rather than something akin to marriage or religious conversion,” he said. For Obama and his allied progressives, for libertarians and business globalists, “there is no unique characteristic that binds Americans together,” Krikorian added. Obama’s pitch also ignores the obligations of citizenship. The citizenship oath makes some of those obligations crystal clear. The oath requires new citizens to be ready to fight for their new nation, according to the most recent version of the oath, set in law during 1952. I will support and defend the Constitution and laws of the United States of America against all enemies, foreign and domestic; that I will bear true faith and allegiance to the same; that I will bear arms on behalf of the United States when required by the law; that I will perform noncombatant service in the Armed Forces of the United States when required by the law; that I will perform work of national importance under civilian direction when required by the law; and that I take this obligation freely, without any mental reservation or purpose of evasion; so help me God. 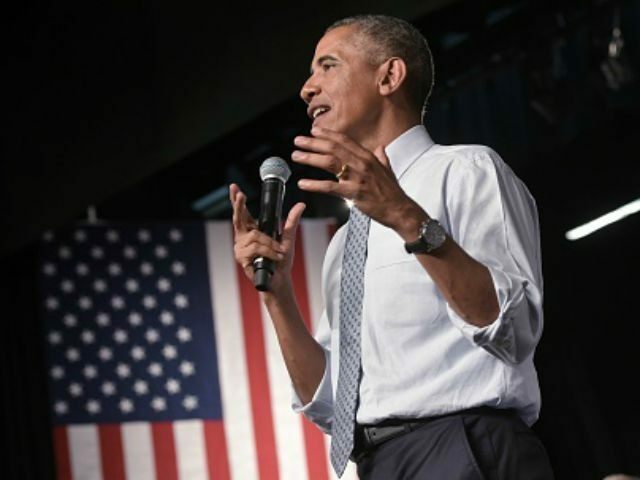 The benefits of citizenship, and a few costs, are described in a webpage linked to Obama’s new citizenship-promoting website, CommitToCitizeship.org. Neither Obama’s speech, not the accompanying website, suggest that new citizens should be proud of their new nation’s culture and history, accomplishments and generosity. “By becoming an American citizen, you’ll take an important towards securing those dreams for all of us, with a promise of better job opportunities, the rights and freedoms enjoyed by every Americans and with the chance to give back to the country you now call home,” he said. Obama’s text about “rights and freedoms… [and] the chance to give back” is accompanied by pictures of voting and of government. That choice reflects the progressives’ belief that government — not family or civic society — is the only significant expression of common actions by Americans. Obama does nothing to praise the native-born American people that created America’s culture, plus the modern world’s ideas, technologies, medicines, post-World War II peace and the worldwide marketplace that has lifted billions of people out of poverty. The video is devoid of any images that suggest Americans’ accomplishments. Instead, the president praises immigrants. “The true strength of a nation lies not not in its might but in the courage and conviction of its people, our hopes, our dreams, our boundless determination to set down roots and build a better life, not just for ourselves but for our families, for our communities, for our children, for all of us,” he said. His video shows images of lower-skilled tasks, such as construction, cooking and driving, along with multiple pictures of families and cityscapes. The only image of high-tech America is a brief video of an air-traffic control tower. The Status of Liberty is repurposed into a summons for migrants. In fact, the status was designed, as a light to the world that illuminates the revolutionary political culture created by native-born Americans. American is not a nation of immigrants. Seven out of every eight people — or roughly 265 million — living in the United States were born and raised here. But the “nation of immigrants” pitch is also repeated by business-backed Republicans, who share an interest with Democrats in boosting the inflow of migrants. “We’re a nation of immigrants,” Wisconsin Gov. Scott Walker said Sept. 17. Those migrants become taxpayer-funded customers and cheaper labor, and later, reliable Democratic voters. However, GOP supporters of mass-immigration tend to support assimilation of migrants into U.S. culture. “We’ve got many great traditions over the years, great people from all over the world, but what was the one thing is they assimilated,” Walker told radio host Laura Ingraham. Business-boosting Gov. Jeb Bush, however, downplays the “melting pot” and shares Obama’s progressive support for cultural diversity that supplants American’s common culture. “For me, Hispanic culture is very important and positive,” Bush says, in a Spanish-language video released mid-September. “Hispanics contribute every day more to our culture [and] are an integral part of the American dream,” he says. Bush, like Obama, views the United States as “a market, not a country,” said Krikorian. Imposed cultural variety, or diversity, is good for the elites, Krikorian said. “The weakening of a strong sense of the common American identity goes hand-in-hand with the growth of strong identity politics and grievance culture, where people are divided into various [competing genetic] groups… that requires the state to take a bigger and bigger role in life because groups have to be measured and represented,” he said. “Without a strong sense of unifying patriotism that relegates those [racial, ethnic, national, genetic] differences to a secondary status, you end up with ‘Leviathan’ — a big government to manage and negotiate the differences between those groups,” he said.